The football concert series with the Harvard and Yale Glee Clubs is now steeped in one hundred vivid years of tradition. 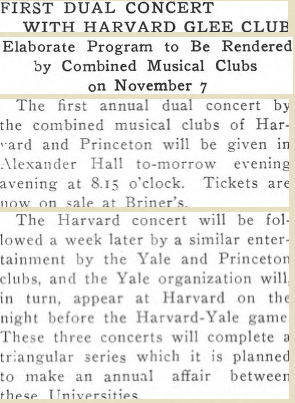 Our first football concert took place in 1912, with the visit of the Yale Glee Club to Alexander Hall, but the first concert in the triangular series (whose centennial we celebrate this year) took place on November 7th, 1913 between the Princeton and Harvard Glee Clubs at Alexander Hall. Then, as now, the combined performance took place on the eve of the football game between the two schools. But some traditions have not survived the century: those first programs were accompanied by the Banjo and Mandolin Clubs of each school. Tell us what you think! Courtesy of Historical Subject Files Collection, Princeton University, and the Historical Photograph Collection, Princeton University. Reproduction is not allowed without permission. 2000's - 1 day until the concert! To end our voyage through the years with the Glee Club and to prepare us for an evening of wonderful music, we have put together some pictures from across the decades that encapsulate the joy that is singing with the Princeton University Glee Club. Thank you to the fantastic Multimedia and Technology Committee who made this project possible, the Mudd Library staff, and most of all to all of our wonderful alumni whose hard work has given the Glee Club its outstanding reputation! 1990's - 2 days until the concert! Professor Walter Nollner (who conducted the Glee Club for 35 years, the longest of any! ), for whom the Glee Club's main Spring concert is named, wrote an extensive handbook for the Glee Club to follow. Here are some particularly noteworthy excerpts from the 1991-92 handbook. 1980's - 3 days until the concert! 1970's - 4 days until the concert! In the summer of 1974, Princeton Glee Club traveled with the Westminster Choir for a six-week tour in Italy. Having been founded in 1874, the tour was a part of Princeton Glee Club's centennial celebration. News of it even appeared in the New York Times! 1960's - 5 days until the concert! Bottom right: Walter Nollner, director, corrects some egregious misconceptions about what the Princeton University Glee Club really is! Apparently the Glee Club jaunted back in the 60s as well! 1950's - 6 days until the concert! A highlight of the illustrious season of 1958. An article on the 1950 spring tour, which included a TV appearance on the "Nick Campofreda Sports Show." A letter from 1958 announcing a few landmark changes in the Glee Club's function and programming. 1940's - 7 days until the concert! Above: An interesting headline from 1942 "Princeton's Oldest Problem Child Comes Into Its Own At Last". 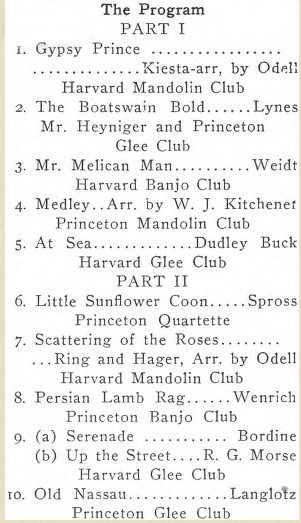 Right: A great article comparing the Glee Clubs of 1894 and 1946. Left: A must-read review of life in the Glee Club in the 1940s. Times are indeed a-changing. 1930's - 8 days until the concert! Though previous football concerts, as with the current football concert, were held in Alexander Hall, the Glee Clubs of Harvard, Princeton, and Yale were all welcome in McCarter Theatre as well. Below is a program from the 1938 Yale-Princeton football concert, and to the left, a photograph of a gathering of Glee Club gentlemen enthralled by their craft. 1920's - 9 days until the concert! The Glee Club (still all-male) on tour! Here is a ticket stub preserved from the 1925 Harvard-Princeton football concert. Price of admission back then was 75 cents, which in today's dollars works out to around $10. 1910's - 10 days until the concert!